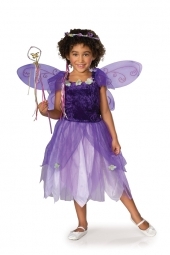 No dressing-up box is complete without a fairy costume. The Plum Pixie has beautiful purple and gold wings, flowered head piece, dainty lacy dress, and most importantly, a magic wand for casting spells. Available in toddler, small and medium. For details of sizing see sizing chart.